This page displays detailed information about a device associated with Workplace"Workplace" describes the Autotask Workplace service in its entirety. and provides access to several device-related functions. Users can only access and manage devices associated with them. If your device has been quarantined due to a suspected security incident and you have created a backup for one or more devices, the only available function will be Restore. If you have not created a backup, all functions will be disabled until your device has been released from quarantine. Refer to Back Up Your Computer for more information on creating backups. Refer to Security for more information on quarantined devices. This process will rename your device in Workplace Online only. Users can only rename their own devices. Open the DeviceA device is computing device that has access to Autotask Workplace, including both mobile devices and computers. Detail. * Wipe is an additional option when you disable or recycle a device. This feature is only available if you have created a backup for one or more devices. Refer to Back Up Your Computer for more information on creating backups. Select the device that has the backed up files you wish to restore. Click the Restore button, in the top right corner of the page. Select the file or folder you wish to restore. Select the machine to restore the files too, then select Continue. Open another dialog box, allowing you to specify the download location. Depending on the size of the backup, the restore time may range from a few hours to a few days. 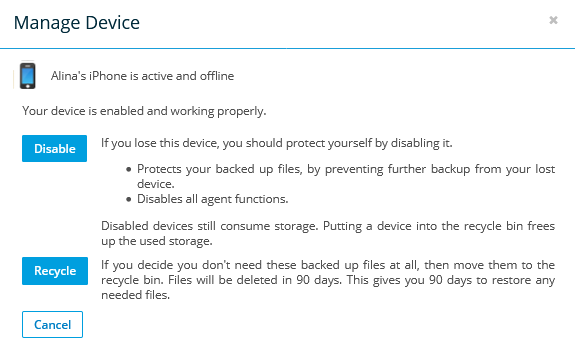 This option is only available when this page is accessed via Team > Manage Devices and the device has been quarantined. Click the View Security Incident button. This will open the Ransomware Incident Detail page for the incident. To sync all projects, click the all Projects link, then click OK in the confirmation popup to complete the process. To choose specific projects to sync, click the Select from a list link to expand the popup, then complete steps 3 and 4. 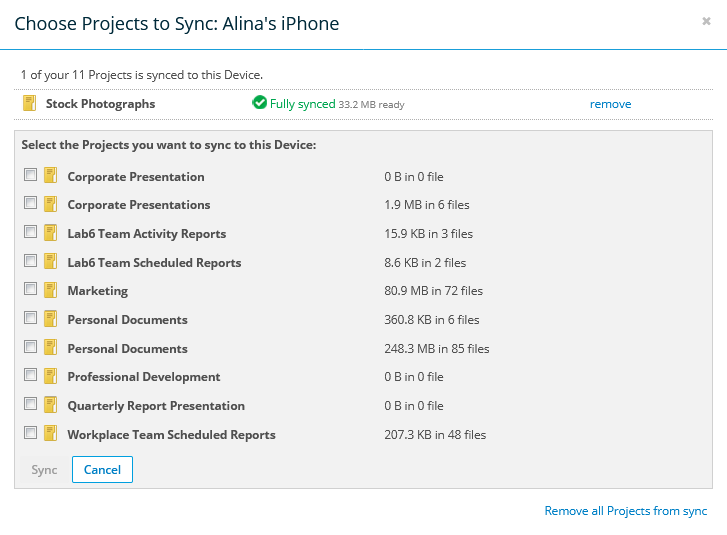 Select the projects you want to sync to the device. When you remove projects from sync, files are not removed from the cloud. They are removed only from the device's Workplace folder. To remove projects from sync individually, click the remove link next to the project, then click Unsync in the resulting confirmation popup. To remove all projects from sync, click the Remove all Projects from sync link, then click OK in the confirmation popup.